In her new book, The Invaders: How Humans and Their Dogs Drove Neanderthals to Extinction, Pat Shipman, retired adjunct professor of anthropology at Pennsylvania State University, sets out a groundbreaking new argument. Talking from her home in North Carolina, she explains how reading about invasive species while holidaying on a Caribbean island inspired her, why more accurate carbon-dating methods have revised the timeline for Neanderthal extinction, and how the discovery of "wolf dog" remains at woolly mammoth sites in Central and Eastern Europe may hold the key to understanding why humans went on to build the Sistine chapel and send a robot to Mars while Neanderthals became a footnote in popular culture. According to Shipman, "Early wolf-dogs would have tracked and harassed animals like elk and bison and would have hounded them until they tired. Then humans would have killed them with spears or bows and arrows." 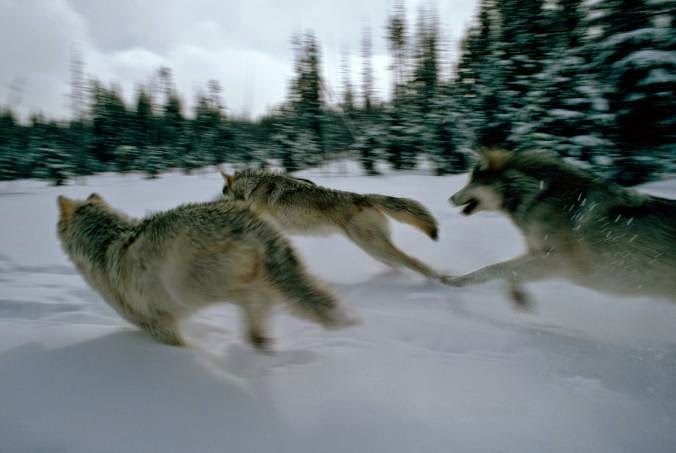 In addition to helping with the hunt, wolf-dogs would have kept rival carnivores and scavengers from stealing the kill — just as wolves protect their kills today. Wolf-dogs and humans benefitted from this remarkable partnership. "This meant the dogs did not need to approach these large cornered animals to finish them off — often the most dangerous part of a hunt — while humans didn't have to expend energy in tracking and wearing down prey. Dogs would have done that. Then we shared the meat. It was a win-win situation." Wolf dogs weren't a hybrid between a wolf and a modern dog; they were a distinctive group. But like the wolves shown above, they were large predators with big teeth. 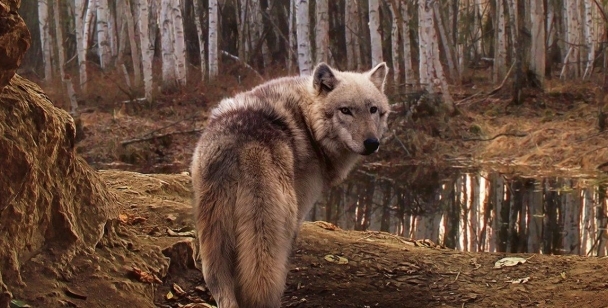 Responses to "Humans Owe Their Survival To Wolves"
It is now known that genetically, wolves and dogs are the same species, just different breeds, so this "wolf-dog" would be an extinct breed. That, and we know Neanderthals interbred with more modern humans, to the point that many of us carry a few Neanderthal genes today. It's an interesting theory. And probably true. It is also known that humans can jog 20+ miles, tracking the animal after an injury or poisoned spear head subdues their prey. And most animals expend energy in quick bursts and can be found gasping for air. So not all hunters used wolves/dogs. I saw an article a couple years ago, where over some 30 generations Russian scientists had selectively bred Silver Fox for the character trait of inquisitiveness. They selected by putting a hand into a cage with a litter of young foxes. The aggressive and the fearful were excluded. What they found was these self selected inquisitive foxes quickly diversified across other physical traits like size, color and body shape. Conclusion was that a self selection process would occur between a group of humans brave enough to tolerate a nearby Wolfpack and the Wolfpack that was inquisitive enough to hang around the humans without threatening them. I think that the social structure of wolves also helped develop the human - canine bond. Don't wolf packs function similarly to humans? They are a close knit group that live as packs and protect each other and hunt cooperatively. Is there any truth in this? No, raising wolves would have made them pack members, the original pack would not "Make Friends" as she states. Besides, who says Neanderthal are extinct? At best we drove them to live in the deep woods, the same area we now have over 5000 sightings of upright bipedal haired ape like creatures. Deep forests don't yield fossil evidence, we don't have a single fossil from apes in the historic record, not one. I think this gal has done allot of work, but, no real research. She had a beer, and came up with a theory about something so long ago it cannot be proved or disproved at this point. Good for her, I guess?! That's the fun part of academia. Expostulate, publish, and assume your wild guess was brilliant. There is very little new here. It has long been known that man has had a long, cooperative relationship with dogs, and that dogs evolved from wolves. But many native peoples have survived in many climates and ecosystems for thousands of years without relying on dogs for hunting. So why assume that no fossil evidence of Neanderthals hanging out with wolves led to their extinction?